Wahhh, how cute is my little nephew!? For his Totoro-themed very first birthday party, Coco Cake (also known as: L.K. 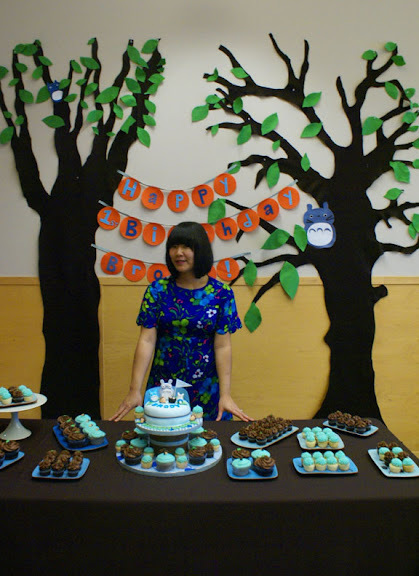 Sung) worked super hard in preparing the 100 mini and regular sized cupcakes and very special fondant-covered, chocolate ganache and chocolate buttercream-filled cutting cake. Do you know Totoro? He is a very hilarious and majestic Japanese animated character who lives in a mythical forest. He flies around trees with his two other Totoro buddies and helps little children in distress. For the Totoro party, my sis requested chocolate cupcakes with chocolate buttercream topped with bright green fondant leaves, and vanilla cupcakes with blue vanilla buttercream topped with little acorns. 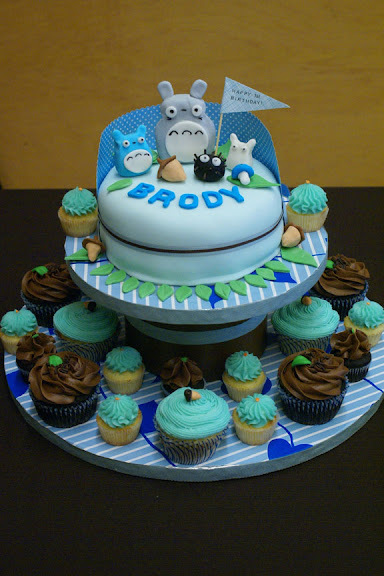 Plus, a Totoro special cupcake for little Brody. But instead of a cupcake… I made Brody a crazy Totoro cake starring Totoro, blue Totoro, white Totoro, leaves, acorn and that little dustball character! 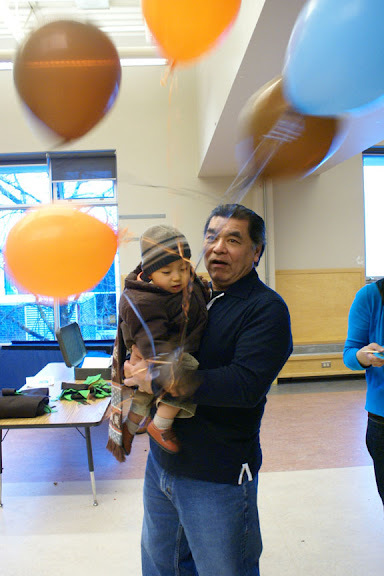 “Team Totoro” also went crazy with decorations: my sis Shelley, my husband Rich and I spent hours making felt decorations, including the cute orange felt “Happy 1st Birthday Brody” sign, the huge felt trees, branches and leaves, and the mini felt Totoros! Oooh and the custom cake stand I made, as pictured at the very top. 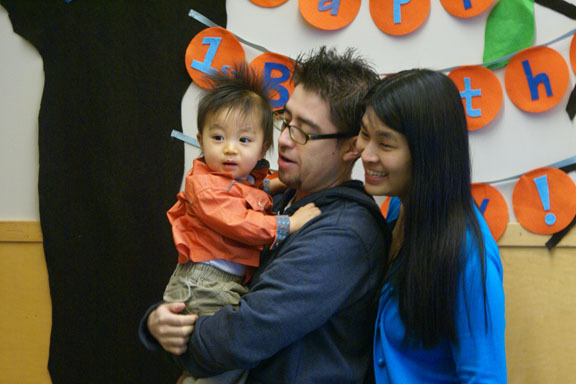 This birthday was certainly crazy but a very fun project… and anything for our sis Leanne and our beloved little guy Brody! Words can’t begin to describe the happiness and gratitude i have bursting from inside me towards the master baker/creator of Coco Cake Cupcakes (aka my baby sis Lynds) and my super-duper teacher/organizer sis Shel and Lynds’ one-of-a-kind husband Rich for their help in making Brody’s 1st birthday party the best TOTORO party EVER!!! And yes, those cupcakes and the adorable perfect cake TASTED as good as they look! :) Thank you! And Bro says Thanks aunties and uncle too!! thanks all!!! i appreciate the comments!! it was soooo fun to create it all… ! Lyndsay, these cupcakes are amazing! All your creations look so delightful, but I am particularly enamoured with the Totoro themed ones. Your nephew is one lucky little guy. The little acorns, the totoros are perched upon that cute cake… brilliant! –jang-a-lang! thanks dude– we miss you!